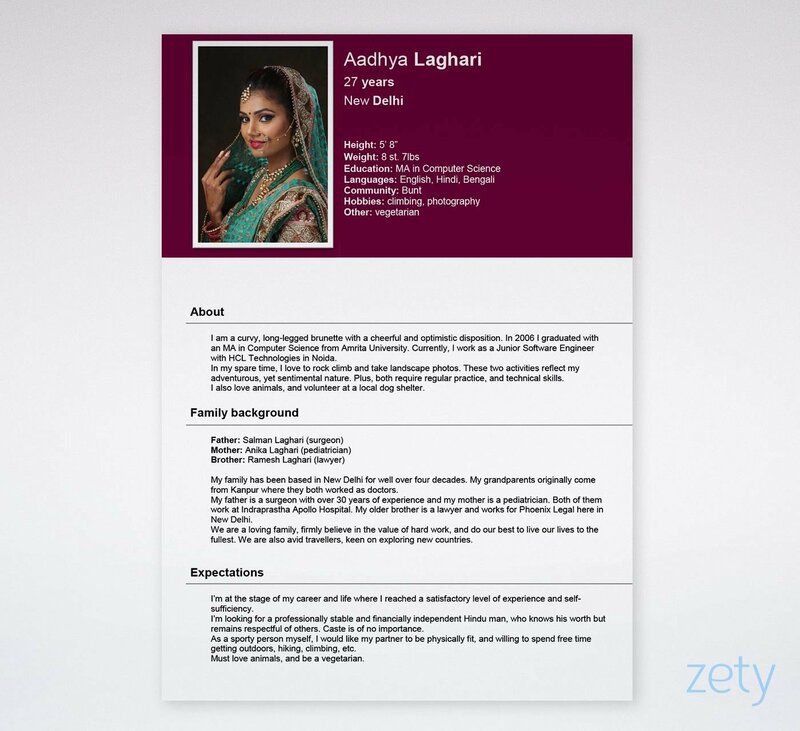 you're two minutes away from your simple and elegant biodata format. 5… 4… 3… 2… 1... zero. Time’s up! In fact, all answers are correct. It depends on the context. The competition is fierce out there! The average recruiter will spend about 6 seconds scanning your biodata format. So, you really need to come across as Sundar Pinchai version 2.0. Well, craft your biodata for marriage so they see Suraj Sharma’s potential, or Freida Pinto’s grace in you! The differences between a resume, CV, and biodata. What to include in a biodata for job applicants. How your biodata for marriage should look. Sample biodata format better than 9 out of 10 other ones. Sample Biodata Formats— Download your FREE Biodata Format here. What is the Difference Between a Resume, CV, and Biodata? Let’s kick off with the similarities. A resume, CV, and biodata are documents that introduce you to your prospective employer, and give them your contact details. They all reveal something about your experience, skills, and education. Resume is a short document (1 or 2 pages) used to apply for jobs. It gives future employers a brief overview of your work history. The word resume is originally a French word for “sum up.” Your resume focuses on and sums up your job-related accomplishments and experience. CV (or Curriculum Vitae, Latin for “course of life") is the alternative to a resume. It is a record of your academic and professional achievements. CVs are often longer than resumes, go more into detail, and their length depends on the applicant’s experience. In the US, CVs are common when applying for academic jobs, research positions, grants, or scholarships. Elsewhere around the globe, a CV is basically a resume. Biodata is a document that focuses on your personal information: date of birth, gender, religion, race, nationality, place of residence, marital status, parents’ names, contact details, current position, salary, etc. It may also contain a brief opening statement, your education, and experience in chronological order. In some South Asian countries (e.g. India, Bangladesh) it is used in the place of a resume. A kind of biodata form may be required when applying for government, or defence positions. Plus, it’s widely used for matrimonial purposes in South Asia. Since the term biodata covers a very broad spectrum of meanings, the look of the biodata formats you come across online may vary hugely. From formal-looking documents with tables, to lists of assessment questions, to indian resume formats, to marriage resumes. and a biodata format for marriage for a girl and a boy. What to Include in a Biodata Format for a Job? Preparing a biodata format may turn out to be a non-issue. That’s because some employers might already have their own biodata format, which you just need to fill in. And this is exactly when our simple and easy biodata format in MS Word comes in handy! Here’s a look at what your biodata format for a job applicant may look like. Let’s have a look at what you may want to include in a successful biodata format for employment. This is what appears at the very top of your biodata format. If you show the good stuff, the recruiter will crave to see more! In general, the opening statements fall into 2 basic categories: an objective or summary. An objective consists of 2-3 sentences that say why you are a good fit for the position. This kind of opening statement is useful for freshers and those whose experience is limited. Hard-working IT graduate interested in pursuing a software engineering position. Skilled in mobile app development, specializing in iOS. Eager to develop his programming skills within an expanding IT organization, such as TopApp Inc.
Make sure your objective presents your strong traits, blends in experience, and shows how you can benefit the company. A summary also consists of a couple of sentences, but it gives the employer some insight into your experience that matches their requirements. Software Engineer with 6+ years in the IT industry. Highly skilled in developing and beta-testing mobile apps. Identified up to 90% of software bugs affecting apps’ stability. Eager to leverage his coding skills to improve the quality of life of average users, and help company X grow exponentially. Specifies your education and/or experience. Uses numbers to quantify what’s possible. If you really want your biodata format to stand out, including the opening statement may turn out to be a real game-changer. In contrast to the previous section, this one doesn’t leave much room for creativity. But this is not to say you can just ignore it! Make sure to include all the relevant information. Double-check the job posting to see if there are any specific requirements for you to follow. While some of these might be required by the employer (contact details, place of residence, phone number), other items on the list may be optional. Word of caution: in most western countries, a lot of this information would be considered sensitive and should not be added to your application, especially numbers 7 through 16. And numbers 17 through 20 would look out of place. 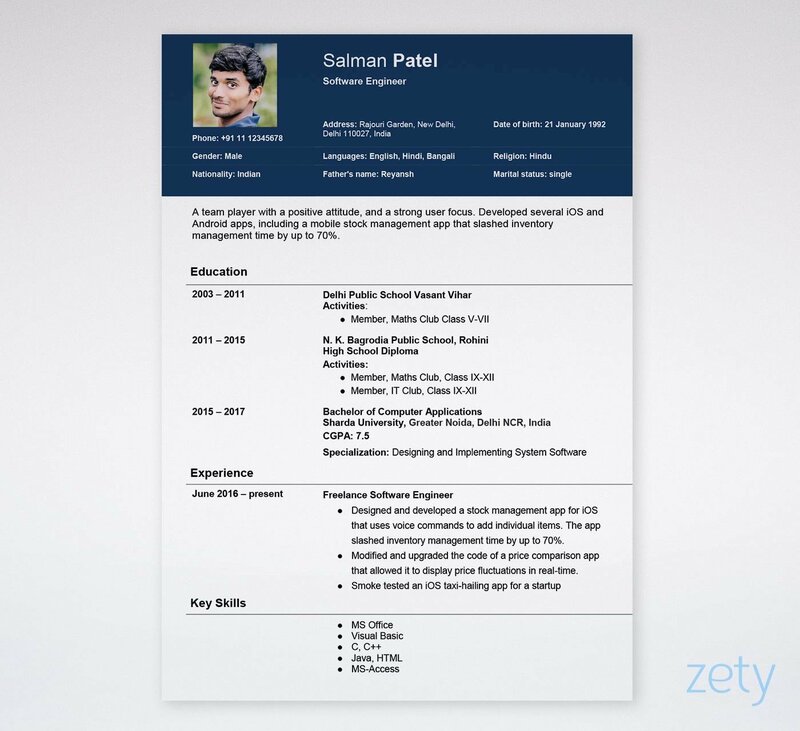 Pro Tip: You can easily change your indian resume format into a reverse-chronological resume. Start your education and experience section with the latest school you finished and position you held. This section lists your education in chronological order. Make it work to your advantage! Keep it simple, but don’t fail to mention coursework and academic achievements relevant to the job on offer. Not sure how to list your education? This is where you list your experience in chronological order. Don’t just list the names of companies you worked for. Experience is so much more than that! First, take a good look at the job posting itself. Does it look anything like that? Design, develop and maintain applications for various devices. Fish out the skills the recruiters are after. Now, think about your experience, and craft this section to address exactly the skills sought for. Designed and developed a stock management app for iOS that uses voice commands to add individual items. The app slashed inventory management time by up to 70%. Modified and upgraded the code of a price comparison app that allowed it to display price fluctuations in real-time. The key is to tailor-make your biodata by targeting a specific job offer, and demonstrating the skills and experience that the recruiter is seeking. In the example above, the yellow highlights reflect the skills required for the position on offer. Pro Tip: The skills you are unable to mix into your experience section can go straight into a separate key skills section at the bottom of your biodata form. Is a biodata format for marriage the same as biodata format for job applicants? It’s like asking if an ATV and Bugatti are the same. Well, both are cars—but serve totally different purposes. The same is true about a marriage biodata and a biodata format for job applicants. Just take a look at our sample biodata for marriage. Now, let’s take a closer look at each of them. This section of your matrimonial biodata should offer a taste of things to come. The trick is to say as much as possible, and use as few words as possible. It’s the photo that does the trick. If the reader isn’t able to take their eyes off you—they’re likely to stick around a bit longer. And if you choose a passable photo. Well, expect your marriage biodata to be quickly passed over. Don’t have a nice portrait picture? Get a photographer to take one! Don’t be tempted to use your smartphone’s front facing camera, and put a ton of filters on your image. This doesn’t just look bad, but may also make someone think you’ve enhanced the image too much. Also, make sure it’s a color picture and a recent one. If you had a photo taken 5 years ago—just forget it. Show more than just your face. It doesn’t need to be a full shot showing you head to toe. A medium shot (from the waist up), or a head and shoulder shot will do. You might also want to consider using a collage of a couple of types of pictures. Or even add more pictures of you in a separate attachment. Don’t use a group photo. Just don’t. It’s all about you. When preparing this section of your marriage biodata, you can easily assume that you’ve sparked the reader’s interest. Now, spice things up with some more details about yourself. I am a curvy, long-legged brunette with a cheerful and optimistic disposition. In 2006 I graduated with an MA in Computer Science from Amrita University. Currently, I work as a Junior Software Engineer with HCL Technologies in Noida. In my spare time, I love to rock climb and take landscape photos. These two activities reflect my adventurous, yet sentimental nature. Plus, both require regular practice, and technical skills. I also love animals, and volunteer at a local dog shelter. Pro Tip: If you have any physical or mental disabilities do not fail to mention them here. In your marriage biodata, your family is just as important as you are. So make sure you approach this section with care and attention. And add an extra paragraph or two briefly characterizing your family. My family has been based in New Delhi for well over four decades. My grandparents originally come from Kanpur where they both worked as doctors. My father is a surgeon with over 30 years of experience and my mother is a pediatrician. Both of them work at Indraprastha Apollo Hospital. My older brother is a lawyer and works for Phoenix Legal here in New Delhi. We are a loving family, firmly believe in the value of hard work, and do our best to live our lives to the fullest. We are also avid travellers, keen on exploring new countries. 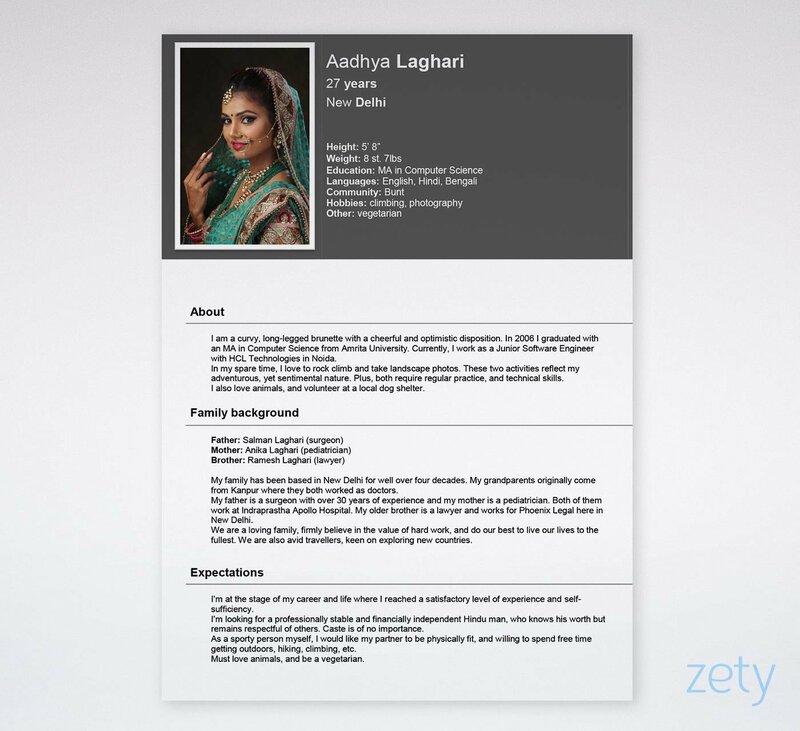 This section of your biodata is where your reader will see if they stand any chances. Make sure not to skip anything you deem essential in your partner. In fact, it might be a good idea to make a bullet point list of the qualities you’re seeking. Then prune it, and leave the ones you couldn’t live without. Then put them all together and prepare a short description. I’m at the stage of my career and life where I reached a satisfactory level of experience and self-sufficiency. I’m looking for a professionally stable and financially independent Hindu man, who knows his worth but remains respectful of others. Caste is of no importance. As a sporty person myself, I would like my partner to be physically fit, and willing to spend free time getting outdoors, hiking, climbing, etc. Must love animals, and be a vegetarian. Pro Tip: You’re looking for someone you’d like to spend the rest of your life with. Not an easy friend. Give this section all the attention it calls for. And then a bit more. Not everybody believes in horoscope matching. If you don’t—you might just want to mention it at the end of the partner expectations section. A short sentence that reads “I don’t believe in horoscope matching,” will do. But, it’s also a good idea to say you’re able to provide your horoscope if need be. This way you express your opinion, and remain respectful. If you do believe in horoscope matching, simply add this short section to your marriage biodata. 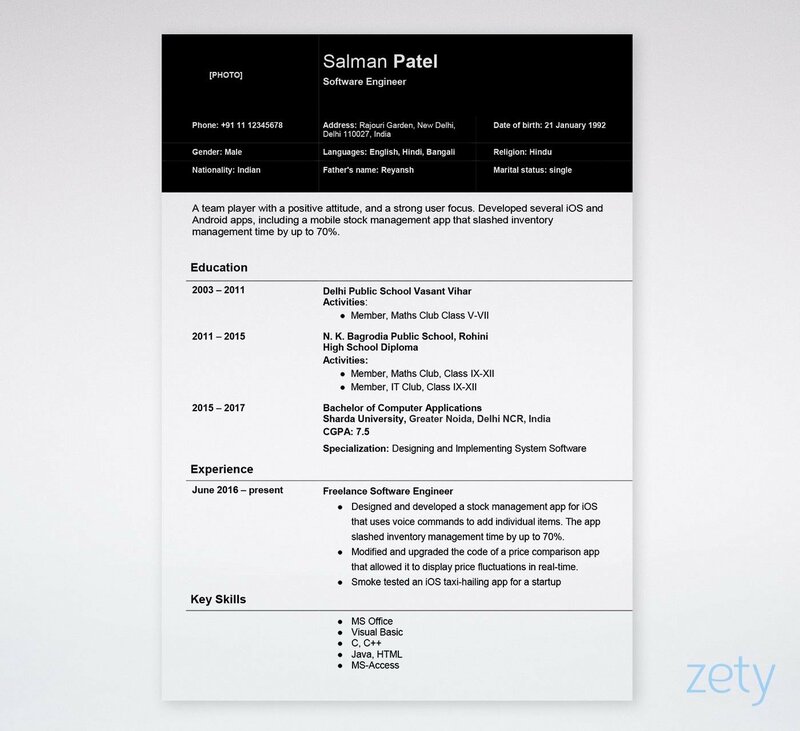 Job biodata format—this could range from a kind of resume, to a list of questions for you to answer. 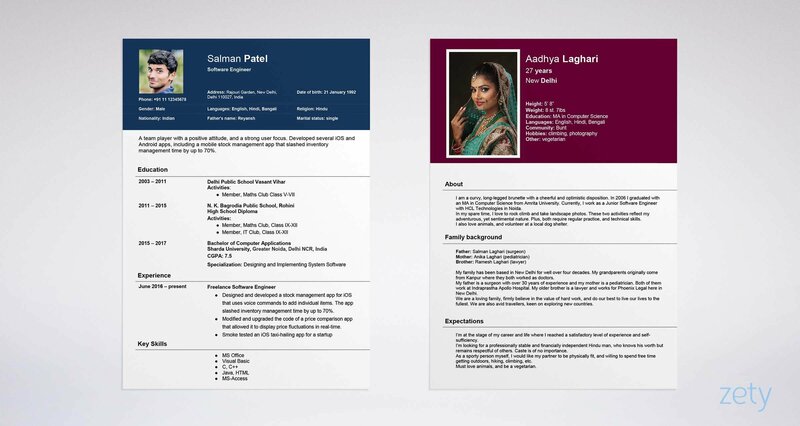 Matrimonial biodata format—a document presenting your matrimonial profile. Biodatas usually present your educational background and professional experience in chronological order. Use our latest biodata format in Word to prepare yours! Do you have your own ideas about making the best biodata possible? Or maybe you want to share your story with us? Give us a shout in the comments section!